Highlights from State of the Union address. WASHINGTON - Highlights from President Bush's State of the Union address. Energy independence: Reduce Middle East oil imports by 75 percent by 2025; currently the U.S. imports about 20 percent of its oil from the Middle East. Promises 22 percent increases in funding for ethanol fuel, hydrogen research, lithium batteries and other gasoline alternatives. Also proposes more investment in nuclear, solar and wind energy and clean-coal technology. White House photo by Eric Draper. Health care: Provide incentives to extend insurance to some of the 47 million Americans who now lack coverage. Put more decision-making in the hands of consumers, hoping they'll push back against soaring health-care costs. Sweeten benefits of health savings accounts. Economic competitiveness: Train 70,000 teachers for Advanced Placement high school science and math instruction. Recruit 30,000 math and science professionals to work in classrooms. Double federal funding for basic research in science and technology over the next decade. Offer tax incentives for university and corporate research. Federal spending: Asks Congress to help create bipartisan commission to address looming funding shortages in Social Security, Medicare, Medicaid. 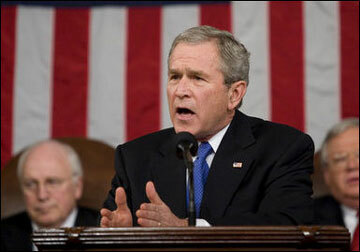 Bush assured Americans that the insurgency in Iraq is being defeated, but he also warned about leaving the job undone. "If we were to leave these vicious attackers alone," he said, "they would not leave us alone." He also predicted American commanders would be able to decrease troop levels. Offered a strong defense of his decision to eavesdrop on communications between the United States and a foreign destination, without approval of a special judicial court. "We will not sit back and wait to be hit again," he said. Also called on Congress to reauthorize the Patriot Act. Demanded that Iran abandon its nuclear program, but also spoke directly to the Iranian people, olive branch in hand: "We respect your right to choose your own future and win your own freedom." Along with the usual boasts about American life, Bush added a new one - improvement in Americans' level of personal responsibility. Citing statistics on abortions, crime rates, welfare and drug use, he contended that a "revolution of conscience" in the United States is underway. Without saying the word "Democrats," Bush took a shot at anti-war critics in the opposition party. "There is a difference between responsible criticism that aims for success, and defeatism that refuses to acknowledge anything but failure," he said. Democrats have been spending weeks "prebutting" Bush's State of the Union speech, arguing the president and the Republicans' one-party rule have failed the country. Newly elected Virginia Gov. Tim Kaine did it one more time in the official Democratic response: "If we want to replace the division that grips our nation's capital, we need a change," he said. 52-minute speech; interrupted by applause 60 times; TV audience estimated at 40 million.